A change of ownership for the Duke Nukem brand has resulted in some hurried rebranding for the upcoming handheld games. Gearbox's acquisition of the Duke Nukem IP was just the lifeline the long-delayed Duke Nukem Forever needed. It wasn't such good news for Frontline Studio's DS and PSP game, Duke Nukem: Critical Mass, however, as the studio's deal to use the Duke Nukem brand seems to have come to an abrupt end. In its quarterly newsletter, Frontline said that Critical Mass was still coming out, but it wasn't going to be a Duke Nukem game anymore. Frontline has renamed the game, Extraction Point: Alien Shootout, and swapped Duke out for a new protagonist by the name of Cam Nash. Alien Shootout is set in 2012, and as the name suggests, revolves around shooting aliens. Apparently Nash had long harbored dreams of being an action hero, so the alien invasion and the subsequent collapse of society actually came as quite a welcome occurrence. The rebranding will obviously present problems for Frontline, not least of which is the fact that it now has to try and sell a brand new IP, rather than a game that had some brand recognition behind it. It doesn't help that the rebranding looks to have been done in a hurry, as all the screenshots in the newsletter still feature Duke Nukem. It seems pretty likely that Extraction Point is going to get missed by a lot of people, although presumably, Frontline will have adjusted its sales projections to allow for that. 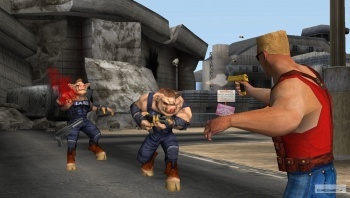 Announced back in 2008, Critical Mass was to be the first part of a Duke Nukem trilogy, with other episodes, titled Chain Reaction and Proving Grounds, to follow. 3D Realms, the original, and now defunct, developer of DNF, was set to publish the game, using it as an opportunity to relaunch its Apogee brand name, which had fallen into disuse in the nineties. Extraction Point: Alien Shootout will be released as a digital download for PSP later this year, and as a download on the 3DS in the second quarter of 2011.